Nearly a year removed from the fight that changed his life, Alex Perez isn’t focused on anniversaries or even what happens after this Saturday’s UFC 227 bout against Jose “Shorty” Torres. It’s all about August 4 for the flyweight from Lemoore, California. Those missteps as a teenager, as well as spending much of his life since high school around UFC fighters and former champions has prepared Perez for moments like these and moments like the one on August 8 of last year, when he submitted Kevin Gray in less than three minutes and earned a UFC contract. But when we spoke on July 23, he admits that a year before on that date, his thoughts were far removed from Dana White’s Tuesday Night Contender Series and the UFC. “I was actually getting ready to fight Chad George at Tachi Palace at 135 for their title,” said Perez, who then got a short notice call to face Gray on the DWTNCS, and the August 3 bout with George was scrapped. After more than six years on the regional circuit, Perez had his chance to get into the big show. And he delivered, with the win over Gray putting him in the Octagon, where he’s since delivered a submission win over Carls John de Tomas and a decision victory over Eric Shelton. The 26-year-old has never been one to sit around waiting for opportunities, compiling a 17-4 pro record before getting the DWTNCS call. And if he wasn’t fighting or training, he was taking in whatever he could learn from his teammates and even cornering them in UFC bouts. Perez has shown a veteran’s cool in the Octagon, and while his opponent Torres appears to be at a sizeable disadvantage experience wise at 8-0, the Chicago native’s 25-1 amateur slate proves that he’s been around. And Perez knows he’s in for a fight. 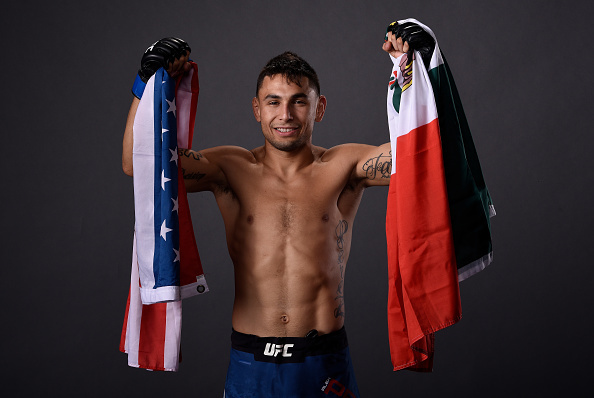 It should also be Perez’ ticket into the flyweight rankings should he pin the first loss on Torres’ record, but like a seasoned competitor, the Californian has learned that in this game, you only worry about what you can control.